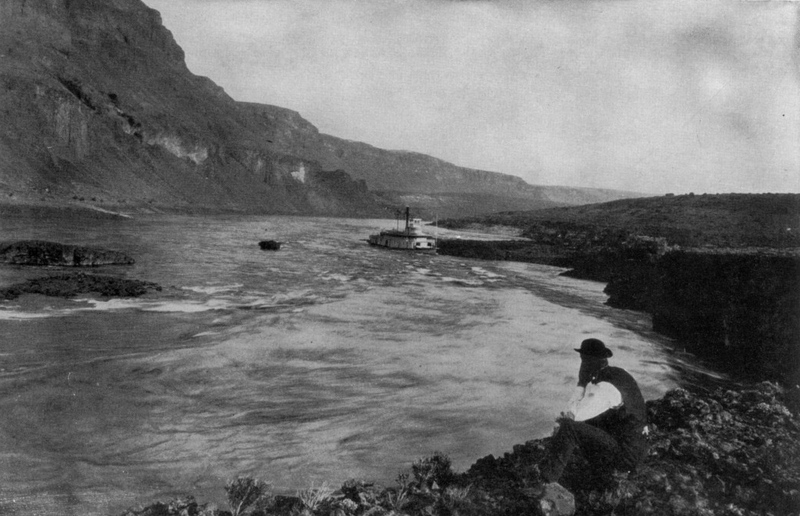 Although Wikipedia describes this image as the steamer John Gates navigating Priest Rapids in 1884, the locality is surely not Priest Rapids, but Rock Island Rapids where the Chelan capsized on her upriver attempt and lost her rudder on her return downriver. I’ve struggled with where to begin the story of the first steamboat Chelan. It’s a tale with roots in the larger conflicts that made the Northwest of the 1870s such a tragic and violent place. The steamboat wouldn’t even have been built if it were not for the breakout of the Nez Percés under Chief Joseph, but it wasn’t built as a direct result of that conflict. It was a response to another attempt by Native Americans to claim their natural rights and to reclaim their freedom. Even so, that was still only an indirect cause of this steamboat’s birth. It was a result of a murder by renegade Indians, angered by the deaths of their friends and family who were cut to pieces by the gatling gun mounted on a different river steamboat. Yet Chelan wasn’t built because the Perkins died. But all of these events led to the eventual arrest of Chief Moses and the removal of his followers from their land in the Columbia Basin. It was the creation of a new reservation for the Sinkiuse Indians that inspired the army to build the Chelan. The boat was needed as a ferry for crossing the Columbia River on the trail to a newly established fort that would safeguard Moses’ Indians on their new reservation.